Avathara sthala of Kamban. 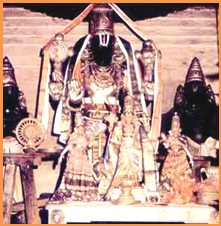 The idols of Kamban and his wife are installed inside the temple. Inside the Rajagopuram also, poet kamban and his wives' images are beautifully carved. There are also many beautiful images which are unfortunately in a dilapilated state. Kamban is believed to have lived at Kamban Medu about a Km from the temple. Annual Kamban Conference is held. There's a beautiful unjal Mandapam (Unjal - Joola - Swing) in this temple. Access to the temple About 2 miles south of Therazhundur Railway Station. Buses ply in plenty from Mayavaram. Features The Poet " Kambar " was born at this Kshetra. The Moolavar of this sthalam is Devaadi Rajan. He is giving his seva in Nindra (Standing) Thirukkolam facing his thirumugham towards east direction. Prathyaksham for Dharma devadai, Uparisaravasu, River Cauvery, Garudan and Agastiyar. This sthalam is a village which is situated in Tanjore district of Tamil Nadu. It lies in between Mayavaram junction and Kuttalam station on the main railway line between Chennai (Madras) to Tanjore. This temple can also be reached by travelling around 7 Kms from Kuttalam and about 8 Kms from Mayavaram. This Divyadesam is also called with other names such as Azhundoor, Azhundh.